Season the pork tenderloin with kosher salt and pepper. Slice the tenderloin into ½ inch thick pieces. In a large non stick skillet heat 2 Tbs of olive oil over a medium-high heat and cook the meat until the center is just slightly pink. The cook time will be just a little under 4 minutes per side. Transfer the medallions to a serving platter and loosely cover with foil to keep warm while the sauce is being prepared. In the same skillet add the remaining 1 Tbs of olive oil and add the chopped shallots to the pan; sauté until they begin to soften, about 1 minute. Add the chicken broth, balsamic vinegar, a pinch of salt, rosemary, the sliced cherries, dried cranberries, maple syrup and the brown sugar and cook until the liquid is reduced by half, about 5-8 minutes. 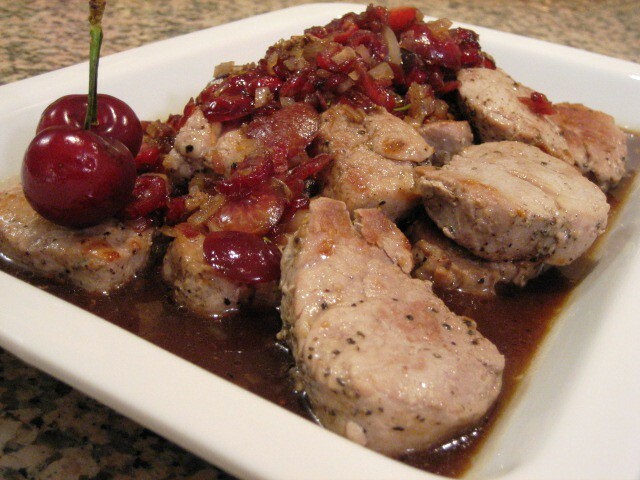 Pour the thickened sauce over the pork medallions and serve.